Traditional “on-premise” telephone lines are a good option for organizations that want to own their own phone system. We have a variety of systems available for offices ranging from two to 200 employees and beyond. Our customers count on us for outstanding service reliability and the type of hands-on support they could never get from the big telecom companies. A Session Initiated Protocol (SIP) trunk is a call path to the outside world that we run over our private network (not the public Internet like other providers). With SIP trunking, a PBX device, which is an actual phone system with all its associated features, lives onsite at your business. As a customer, you purchase the system up front and are responsible for maintaining and upgrading it. 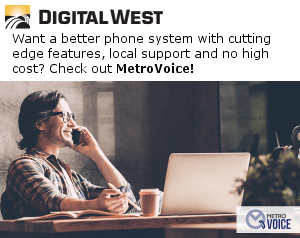 You can buy one of several phone systems directly through Digital West. Unlike a cloud-based phone system, enhancements and upgrades to a SIP system are extra. There are no limits to the number of lines that can run on a SIP trunk, so this option is suitable for a wide range of organizations. Note: The most important difference between Digital West’s SIP trunking and SIPs you might receive through national providers (e.g., Vonage, RingCentral, 8×8) is that your data runs over a dedicated circuit on our private network, not the public Internet. We engineer the network to prioritize voice data is prioritized over all other data, which guarantees call quality, not to mentioned strengthened security. Primary Rate Interface (PRI) is a digital circuit that carries up to 23 concurrent phone calls and can run over T1 copper cable or fiber optics. PRI’s biggest benefits include inward Call IR with Direct Inward Dial (DID) numbers. These are 10-digit phone numbers that bypass any programming in the phone system and ring an extension, department or fax machine directly. With PRI, you buy and upgrade your own physical phone system. Our basic package starts with six call paths, unlimited in-county calling and 1,000 minutes of long distance. As you approach full use of the 23 lines, you can add another PRI or consider moving to a hosted phone system. Plain Old Telephone Service (POTS) lines uses an analog system, the oldest type of phone system available. POTS circuits are not power-dependent, making them particularly well-suited for elevators and alarms. Pairs of copper lines plug into outlets in your building, and voice data is sent over a circuit into one of our data centers, where it is distributed to the intended recipients. POTS lines are generally suited for offices with eight or fewer people. Once again, you invest in and support your own physical phone system with POTS. We also offer Business Lines (with and without features) off an Integrated Access Device (IAD). These lines run over a fiber, DSL or T1 copper connections and can support up to 24 lines. Unlike POTS, any call path off an IAD is power-dependent, so if a building loses power, it will also lose phone service.